To me, sweet potato biscuits evoke feelings of warmth and comfort and a down home cooked breakfast. I make these with a yellow fleshed variety of sweet potato. There are actually a number of varieties of sweet potato which will have different colored skins and different colored flesh. The normal variety usually seen in the American market will have orange flesh, and that’s alright, it won’t affect the flavor of your biscuit, but give it a rich golden color. So if that’s what you have, feel free to use them. To make sweet potato biscuits, you will need cooked sweet potato. I often make baked sweet potatoes to have for my barbecue cookouts, where I serve them like jacket potatoes, but with nutter, cinnamon and a pinch of brown sugar or brown sugar sub. They really don’t need much sweetener at all because as they cook, they gain a natural sweetness. But baked plain, and having leftovers leaves the options of just a simple reheat, making into a casserole, make into fritters, or (as I have done here) use the mashed flesh in sweet potato biscuits. Now, if you haven’t had these before, you might be suspicious and wonder what kind of flavor they have. The sweet potatoes do flavor the biscuits with a hint of flavor, but not overwhelming. Think potato bread and you’ll be on the right track. What the sweet potatoes do tend to do to the biscuits is tenderize them, helping keep the crumb of your biscuits soft. I serve sweet potato biscuits in a Southern U.S. fashion, as a bread for dinner, or with a hot cooked breakfast. They are wonderful just with butter, or drizzled with honey or molasses. They also take kindly to a bit of chile honey if you have that. They are wonderful smothered in sawmill gravy, and make a perfect little breakfast sandwich with a cooked egg or slice of country ham. They are quite simple to make, and you can cut the fat in with a pastry cutter or pulse with your food processor. Just be careful not to overwork. As much as you can leave the butter/shortening or lard in flat thin sheets in between layers of the flour, the flakier yur biscuits will be. Handling the dough too much causes the fat to soften and melt and disperse, leaving a good buttery flavor but less flaky dough. Roll out, you can cut these with a biscuit cutter, cookie cutter, or use a drinking glass with a floured rim. I don’t advise shaping them by hand because of the warmth in your hands overworking the dough. They are too thick for drop biscuits, but left as a thinner dough, perhaps that would work. But I like rolling biscuits. I have a collection of many types of pins and I like to use them. If you have no rolling pin, you can substitute with a wine bottle, dowel, or any smooth surfaced circular edged object like that if it doesn’t have an angled edge or ridges to mar your dough. The type of flour used is a soft wheat, all purpose white flour, not a whole wheat flour. It will look just like your normal ap flour, but it is ground from a different kind of wheat, a winter wheat, rather than a normal hard wheat variety, and has less protein than hard varieties. It is kind of the opposite of using bread flour, which is hard and contains even a higher amount of protein than normal all purpose flour. White Lily is probably the most popular brand of soft wheat flour in the Southeastern U.S. If you can’t find it, try using “Swans Down” cake flour. Pastry flour has just a bit more protein than cake flour, so try to stick to the White Lily or cake flour if you can. You *can* make biscuits from other flour, but the texture will not be the same. But if that’s all you have ever made biscuits with, you won’t notice a thing. Sift together 2 cups of the flour, baking powder, salt and sugar in a mixing bowl. Reserve the remaining 1/4 cup for later. Using a pastry blender, work in the lard, butter or shortening until the mixture until the mixture resembles coarse crumbs. You can also pulse the dough in your food processor if you prefer. Whisk together the mashed sweet potato with the buttermilk in a small bowl. Make a well in the center of the flour mixture in your mixing bowl, and pour the buttermilk/potato mix into this. Use a spatula to gently mix the wet and dry ingredients together. If the mixture is very wet, add some of the remaining flour to adjust the dough. It should be tacky, but not overly wet. Sprinkle some flour on your work surface and roll out the dough to about 1/2-inch thick and cut out with a biscuit cutter or suitable substitute. Place biscuits on a parchment or silicone lined baking sheet. If the sides touch, they will have softer sides, as would they if they touch the sides of the pan. If you like crispier sides, leave them a bit apart. Bake in a preheated oven about 12 minutes or until golden brown. 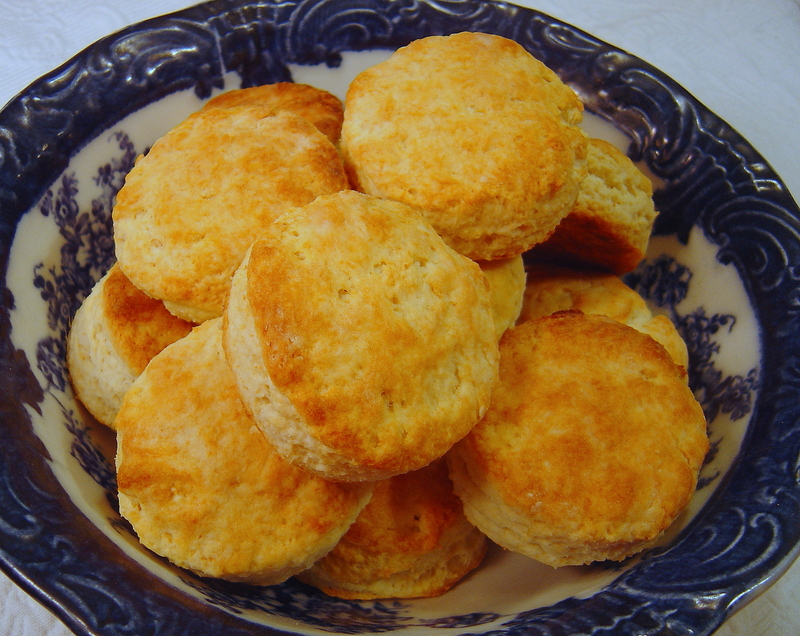 Serve biscuits warm, spread with butter and honey, or warm molasses, apple butter, or a dallop of homemade preserves. Sue, will this work with canned yams? Yes, just ditch the syrup and mash it with a fork.